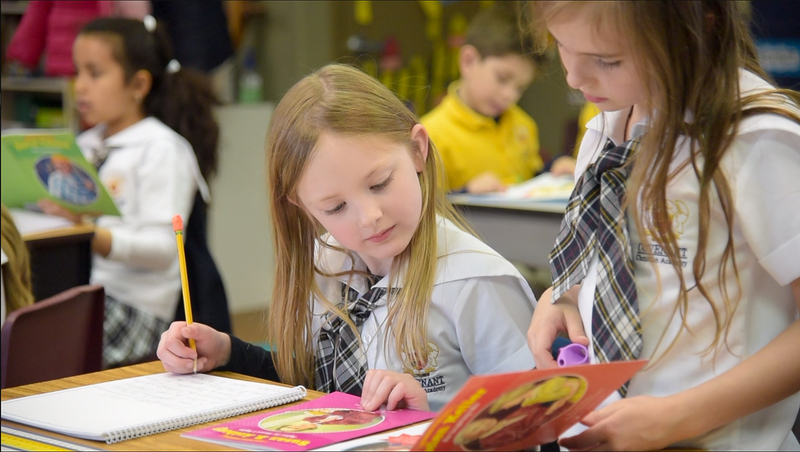 The one distinguishing mark of a Christian school relates to that one unique reason for Christian education: to gain knowledge of the world from God’s point of view through the application of Biblical principles in every area of curriculum and school activity. 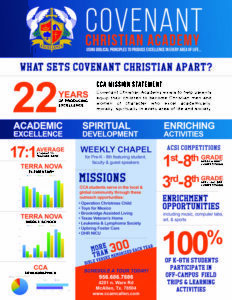 Covenant Christian Academy is committed to excellence in the area of curriculum and academics. All components of the curriculum are carefully selected and designed to fit the philosophy of biblical education and to align with academic state standards. Young children are naturally responsive to music and enjoy all types of musical experiences. The music program offers opportunities to explore and develop singing and performance skills through music. In addition to learning about and enjoying music, children develop listening skills, coordination, self-expression, emotional responses, and confidence through performance opportunities throughout the year. Elementary students perform during Veteran’s Day, Grandparents’ Day, and Pastor Appreciation Day chapels. Elementary students perform in various community service ministries such as Calvary Baptist Church, Brookridge Assisted Living and Memory Care, and the Texas Veteran’s Home. All Elementary students perform at the annual Christmas Programs. All Elementary students perform an Easter-themed program during the school’s Spiritual Emphasis Week. 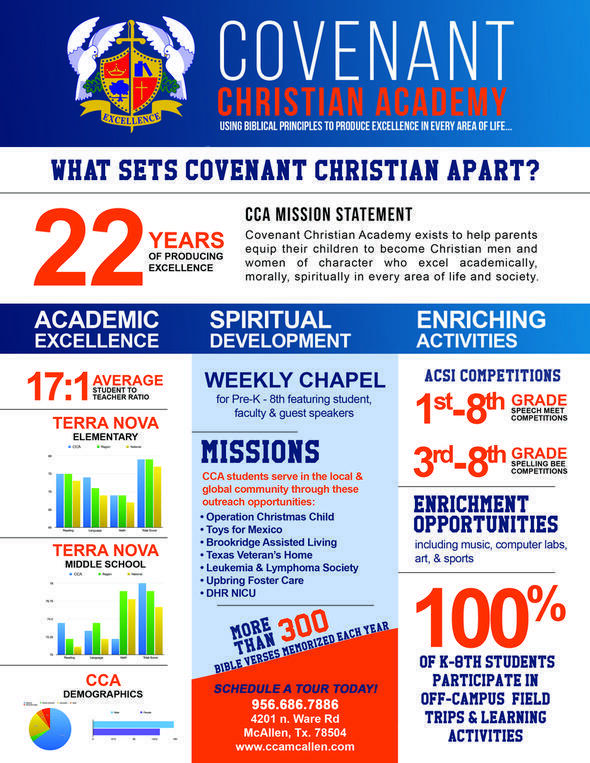 Covenant Christian Academy’s Library provides an environment where students and staff have access to a wide variety of books and materials in order to encourage a love of reading and life-long learning. Through stories, activities, and technology our program helps students recognize and utilize the many benefits that a library media center has to offer including: book browsing, book borrowing, reading for enjoyment, and searching for information. Our goal is to support, enhance, and enrich the curriculum as well as meet the needs and interests of our young students as they grow and develop along their journey of learning. Our students also participate in the Accelerated Reading program that enhances their independent reading skills. The physical education program is scheduled for 30 minutes, 4 days a week for all elementary students. Gross motor activities designed to develop large muscle groups dominate the physical education program. The development of physical fitness and coordination skills is also planned through activities. Activities emphasizing running, jumping, hopping, skipping, and galloping, along with ball activities and organized games fill a class period. This plan develops individual skills to be used for organized sports. Emphasis is also placed on body awareness – how the body moves and functions. The Elementary students use Rosetta Stone, an online program, to learn the fundamentals of the Spanish language. The program helps all types of learners to read, write, and speak Spanish. The program is offered twice a week. Middle School Conference – The first two days of school are dedicated to learning the ropes in Middle School. Team building activities at Camp Loma de Vida, anti-bullying campaign, organization skills, learning locker combination, rules, and procedures are all part of the middle school process. Electives – Each student has a choice of an elective class. This year the choices are Library Aid, Teacher Aid, DIY Fun, Study Hall, Rosetta Stone, Crocheting, and reading to babies in the NICU at Renaissance Hospital. Colonial Holiday – Middle school students participate in the Battle of Yorktown re-enactment. They spend several weeks preparing the re-enactment complete with sound effects, costumes, smoke bombs, and mock fighting. It is an impressive show! U Week – Mind, Body, and Soul is the theme for U Week. Students take part in learning about making good and healthy life choices, and the wonders of God’s creation of man and woman. The middle school dance culminates U Week and the kids have a blast! Student Council – CCA Student Council is open to all 6th-8th graders. Students campaign for class representative, treasurer, secretary, vice president, and president. All students and teachers vote for their choices. Members serve the school and community in various capacities including making donations to needy causes. Eighth grade trip to Washington DC – The CCA middle school experience culminates with a trip to our nation’s capital, Washington DC! The students view and visit the many historical sites and partake in the activities at several museums. Everyone looks forward to this six day trip. Eighth grade graduation – Eighth grade students and families enjoy a banquet to celebrate the completion of Middle School. Awards are given out and honors recognized at this event.